HERE IS HER REVIEW: "I am pleased with my copy of this book. It's a wonderful value for only $2.50! 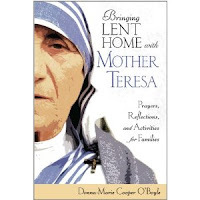 Each day of Lent has 2 pages devoted to reflections, prayers, a brief story from Mother Teresa's life, suggestions for almsgiving and fasting. As an example, one day encourages asking children to fast from complaining and then give away 10 beautiful smiles for almsgiving. I especially appreciate that there is a reflection for parents, and then also a family prayer for each day. I look forward to sharing this book with my family this year! The days are not dated, so this is a wonderful Lenten companion for many years."